Product prices and availability are accurate as of 2019-03-21 14:18:50 EDT and are subject to change. Any price and availability information displayed on http://www.amazon.com/ at the time of purchase will apply to the purchase of this product. 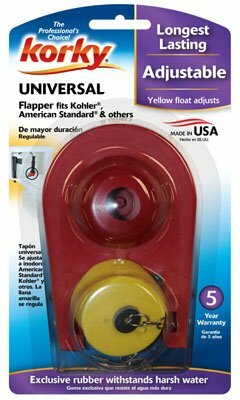 Korky Plus Red Adjustable Flapper, Includes A Float On The Chain For The Adjusting Of Flush Volume, Universal Fit Which Includes American Standard & Kohler, Manufactured Of Chlorazone Material, 5 Year Guarantee, Blister Card.